Streamline Moderne Station: Image courtesy of Chester Liebs, American Roadside Architecture, 1985.
manufacturers and designers heavily employed the Streamline Moderne, or Depression Moderne, style. rounded corners, and sleek lines. The design was enhanced with porcelain enamel walls and large plate glass windows. 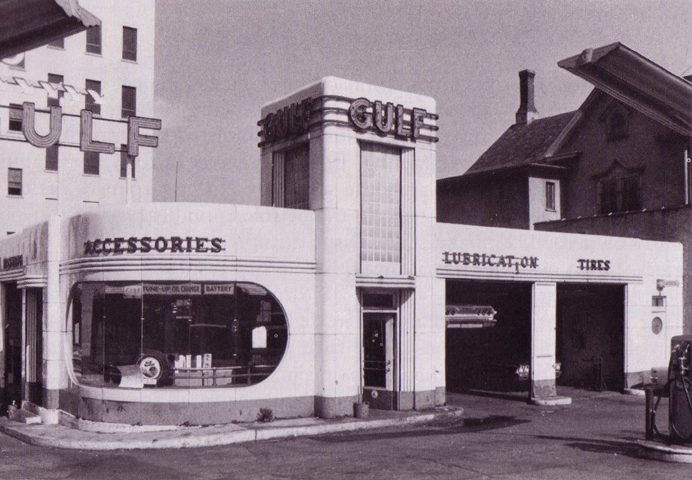 The Streamline Moderne gas station was originally designed as a one-story box. Eventually, the entrance bays were extended above the first story, like a tower, or raised out from the front façade. This style lasted through WWII into the early 1950s, at which time it was phased out for more modern designs. that was initiated by Hermann Muthesius (see e.g. Mossehaus). the aerodynamic pure-line concept of motion and speed developed from scientific thinking. Cylindrical forms and long horizontal windowing also may be influenced by constructivism. As a result, an array of designers quickly ultra-modernized and streamlined the designs of everyday objects. Manufacturers of clocks, radios, telephones, cars, furniture, and many other household appliances embraced the concept. fitted out 1933–35, twelve tall pillars of Lalique glass, and 38 columns lit from within illuminated the room. was one of the first uses of internally lit architectural glass, and coincidentally was the first Moderne interior preserved in a museum. Sharp angles were replaced with simple, aerodynamic curves. Exotic woods and stone were replaced with cement and glass. Art Deco and Streamline Moderne were not necessarily opposites. seeing it as effete and falsely modern—essentially a fraud. as part of relief projects sponsored by the Public Works Administration (PWA) and the Works Progress Administration (WPA).